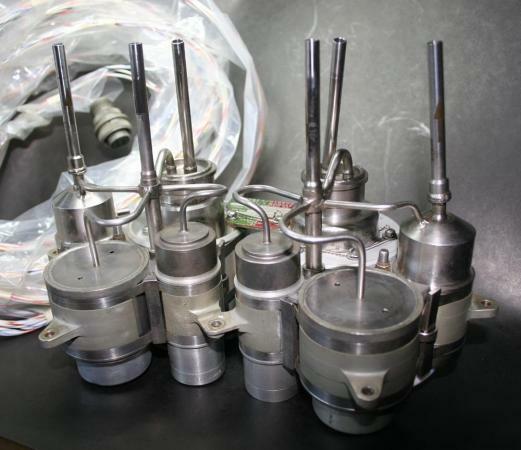 A System (Tank) Valve Module (Apollo Oxygen Hydrogen Service Module) manufactured by PARKER-HANNIFIN circa 1967-1971 used to provide overboard relief of elevated pressures within the stored LH2 (Liquid Hydrogen) and LO2 (Liquid Oxygen) tanks in the Apollo Command Service Module (CSM). This system also sensed LH2/LO2 tank pressures, regulated the tank heaters and controlled the tank destratification motors (motors used to execute the CRYO-STIR in the LOX/LH2 tanks for "slush" mitigation). The modules were in-line between the LH2/LO2 cryogenic tanks and the CSM Fuel Cells. The Systems (Tank) Valve Modules for the hydrogen and oxygen systems are functionally identical. Each module contains two relief valves, two pressure transducers, two pressure switches and one check valve. The relief valves are a differential type designed to be unaffected by back pressure in the downstream plumbing, The valve has temperature compensation and a self-aligning valve seat. Relief crack pressure is 273 psig minimum for hydrogen tanks and 983 psig minimum for oxygen tanks. Full flow pressures (LO2) is 1010 psig (maximum) and for LH2 285 psig (maximum). Module pressure switches are a double pole single throw absolute device. A positive reference pressure (less then atmospheric) is used to trim the mechanical trip mechanism to obtain the absolute switch actuation settings. Reference pressure is typically between 4 to 10 psia. The motor driven switch controls power to both the tank heaters and destratification motors. The pressure transducers, are an absolute (vacuum reference) device. Each transducer consists of a silicon pickup comprised of four sensors mounted on a damped edge diaphragm and an integral signal conditioner. The unit senses tank pressure through the discharge line from the tank; signal conditioner output is 0-5 VDC analog output which is linearly proportioned to tank pressure. The check valve, is designed to open at a differential pressure of approximately 1 psia. The single poppet is spring loaded and has a large area to prevent chattering during flow in the normal direction. This large area also helps in obtaining a positive seal if pressurized in the reverse direction.